This year has been a hard one outside reading and reviewing books. I have managed to review by the end of the year 90 books which is down on other years. But next year is the tenth year of running winstonsdad I have reviewed books from 115 countries in that time. I have been to a good few book prizes and other books events. This last year or two I have slowed down as life has caught up but also thinks like passing my test two lessons a week for well over twelve months till I passed last month has eaten into my time to read and review somewhat. Anyway, a new year is fast approaching and I am trying to get the blog to 1000 reviews next year. to mark ten years of the blogging. I can’t believe thatr in ten years I have nearly read a 1000 books given that I don’t review all the books I read I am near reading a thousand I say but I am never one for keeping track of these things. Anyway a quick post just let you know in the next year there may be more reviews than this year. Paradise reclaimed – a farmer from a small farm goes in search of the promised land of Utah as he takes his wife and two children on a disastrous journey. Iceland Bell follows a man who happened to make a bawdy joke about the Danish King in the 17th Iceland under the rule of Denmark. He becomes a fugitive . A young Emissary from the Bishop of Iceland is sent to snaefells glacier to find out what is going on and finds a community that thinks it is the center of the world. and creation is a work in progress. A lonely Orphan who wants to become a poet we follow his affairs poverty, loneliness and the scandals he becomes involved in. A great haul and I love the simple cover art in the series as well. Well, I managed to review 8 books last month. Which as I was off work and still very down most of the month wasn’t too bad.I also saw the blog past nine years and also announced the annual Spanish Portuguese lit month . I also added two new countries to the blog a couple of African title. No new publishers but a few titles I’ve wanted to review from the likes of Camara Laye and Romain Gary both been on the tbr pile for a number of years. 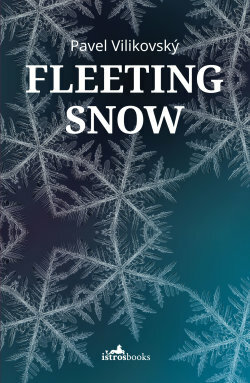 Fleeting snow is the book of the month. I always like books that make you think after you have read them and also would consider rereading this title has both of them a journey into what is life and memory also who are we what is the meaning of our names in a way. The first Slovakian title from Istros book was a real joy as much of there books have been. Looking forward I have a Columbian writer I have featured a number of times with what for me is his best book. The lost debut novel of a Portuguese great as the first couple of Spanish-Portuguese lit months books. I also have the 100th French title for the blog and a Baltic novel. Well the latest Album by Sons of bill came out a band I have been a fan of a for a number of years. Oh and the world cup started, I have watched some games. But somehow I am still not as spirited as I have been previous years Maybe as we move on England I may get the spirit somewhat. I have returned to work and am back on track being a bit more open and facing things that have happened. But back to the books looking forward to seeing what everyone chooses for Spanish Portuguese lit months. I like the App tells you now when the anniversary of the blog. Well, mine was last night nine years have flown with 832 books under review on the blog averaging nearly a hundred books a year over the course of nine years also a total of 1568 post over that time as well a post every other day over the course of the nine years. I have enjoyed many things through this blog and have met many people over the course of the last nine years. I move on to the decade of this blog next year I want to try and add a few more countries and maybe get nearer the 1000 books under review. Many thanks to all that comment and like the post over the last nine years. Waterstones in Torquay was the first bookshop. I found these two from not a great selection of translation. Well for someone that read as much as me there is not many that I hadn’t read but there was a few Georges Simenon and this the latest Maigret was one that was most interesting as the great man is looking back on a case he may have got wrong. The I have read nearly all my current Modiano books. This is the one I next wanted as I know Frank the translator really wanted to translate this book. It is his first three novels all link by being set during the occupation of France or the effects of that on people. Then We visited Totnes and they have a great independent bookshop. In which I found these three gems. The day before happiness by Erri de Luca an orphan boy coming of age and his relationship with the guardian. It is also an ode the city of Naples where the book is set.Then I am really keen on this one Death in spring another coming of age novel of a teenage boy in the Catalan mountains. It reminded me of the great book Stones in the landslide which is also a coming of age tale. But a young woman in the Catalan mountains. Then A book by Arto Paasilinna, I loved his year of the Hare so hope this one is as interesting.It follows a man called Gunnar restoring a MIll in a small village but Gunnar isn’t all he seems. Now I find an Oxfam shop hard to resist when I see one like the one in Totnes and here I found two old Penguin modern classic. Boris Pasternak’s Last summer came out long before Doctor Zhivago and heralds the last summer before world war on and the Russian revolution. Then a lesser know Faulkner work he is a writer I loved when younger but haven’t read for years and have been adding to my copies of his lesser known books. The Tove jansson this is her only novel and seems to have similar themes to her other adult books. The Noght wood a classic modernist novel that I have heard is quite a challenge to read. Then there was the sad news of the passing of Sergio Pitol. A writer who I have on my kindle after kindly been sent it by his Publisher Deep Vellum had passed so I felt as I had never got to this great man’s books. This trilogy is about his life and those writers he meets and what inspired him as a writer.I ordered these and they were here at home when I arrived home today off holiday.Also, I had three other books. Then I had these books at home Scenes from a childhood is a selection of Short stories from Jon Fosse the Norweigan writer is often cited as a future Nobel winner I reviewed him a few years ago Then Romain Gary last novel one of the great French writer and also a twice Goncourt winner the only one as he used an Alias to writer his other winner. Then last is The blind spot essay of fiction by Javier Cercas and the line between fact and fiction which is one his own books walk like a tightrope at times.